Milton, Steve. "Gaylord Powless". The Canadian Encyclopedia, 10 January 2018, Historica Canada. https://www.thecanadianencyclopedia.ca/en/article/gaylord-powless. Accessed 24 April 2019. Gaylord Powless was the oldest of 14 children born to Wilma and Ross Powless. His ancestors migrated to Six Nations of the Grand River, Ontario, from New York State after the American Revolution and have lived there for more than 200 years. Gaylord held his first lacrosse stick when he was two years old and, by the age of three, was entertaining fans during halftime at senior games in Huntsville, Ontario, where his father, Ross, was playing. Ross Powless, who was one of Canada’s best players, travelled to a variety of towns and cities every summer to play box lacrosse for a small stipend. Gaylord and his siblings grew up listening to the stories and spiritual traditions of the game, as told by their father. Gaylord attended a one-room schoolhouse in Six Nations of the Grand River. When he was young, his father built a backdrop made of wood and chicken wire, 12 metres wide and six metres high, so the boys could practise lacrosse in the backyard. His brother Richard said practice made Gaylord’s backhand passes so accurate that he could hit his teammates’ sticks without even looking. Each Powless boy had two wooden sticks: a game stick and a spare. At the insistence of their father, Gaylord and his brothers ran along the roads of the reserve to build up their lungs and legs for lacrosse. Gaylord played minor lacrosse in Brantford, where he was one of the best players. By the age of 12, he had become the target of hard physical play and racial taunts. He often retaliated with rough play and fighting and was thrown out of games. However, he began to control his temper after his mother threatened to stop attending games and his father threatened to make him quit if he didn’t stop retaliating. He also studied his teammates and their tendencies and became a playmaker, as well as an outstanding shooter. When Powless was 16, he began playing for the Hagersville Warriors, an intermediate team coached by his father, and he stood out among the adult players, even as a teenager. Jim Bishop discovered Powless when he was playing for the HagersvilleWarriors and signed him to the Oshawa Green Gaels. Bishop coached the Gaels to the 1963 Minto Cup, which was awarded to the Canadian junior men’s lacrosse champions. Compared to the lumbering approach of many teams of the era, the Gaels played a fast game, and Powless’s speed and ability to anticipate plays suited their style perfectly. Powless moved to Oshawa, where he lived in a boarding house, completed high school and practised lacrosse at least once a day. Powless wore number 15 on his jersey and made it synonymous with his name. He had three goals and five assists in his first Junior A game, against Long Branch. That year, he played two games with future hockey star Bobby Orr, who went to the same Oshawa high school. They took a class together and, as two of the top sports stars in the small town, became friends. Powless was excellent at face-offs, which was an important factor in the Gaels winning the 1964 Minto Cup. That year, he won the Jim McConaghy Memorial Award as the most valuable player in the Minto Cup tournament. He was also named winner of the Tom Longboat Award, which is given to the Canadian Indigenous athlete of the year. His father, Ross, had won the Tom Longboat Award twice. The Gaels moved to the new Oshawa Civic Centre in 1965, packing the arena with their entertaining and winning style of play, and won the Minto Cup again. In 1966, Powless racked up 191 points, setting a new Canadian single-season scoring record for junior lacrosse. The previous record had been held by John Davis, Powless’s former Gael teammate. Because he was so skilled, he took a lot of physical abuse and wore braces with steel plates to protect his legs from low-stick blows. He also faced racist taunts in opponents’ arenas and had drinks thrown at him through the mesh around the boards. But he didn’t mind the “Marvellous Mohawk” nickname by which he became known during his junior career, as long as it was used with respect. When Powless won his fourth and final Minto Cup in 1967, he was once again named the national tournament’s most valuable player, despite playing with a taped back, an injured calf and a badly injured finger. It was his last year with the team because he no longer qualified as a junior. The Gaels dominated the championship for seven consecutive years (1963–69), with Powless being the central player for four of them (1964–67). Every year of Powless’s junior career, the Green Gaels beat the New Westminster Salmonbellies in the finals of the Minto Cup. His coach, Bishop, remarked that Powless had the best coordination and fastest reflexes of any athlete in any sport that he’d ever seen. Just as Powless was graduating from the junior lacrosse ranks after the 1967 season, the professional National Lacrosse Association (NLA) was formed. The Detroit Olympics, which were run by Bishop, Powless’s junior coach, paid him $80,000 to join the team. Powless finished second in the NLA in scoring, and his 63 goals were more than twice as many as the next highest-scoring Olympic player. Detroit won the four-team Eastern Division but lost to New Westminster in the NLA finals. The NLA folded after one season, and Powless played for Rochester in the New York professional league in 1969. Two of his brothers, Harry and Greg, also played for the team, while his father, Ross, was coach. He joined the Brantford Warriors in 1970, winning the Ontario Lacrosse Association’s Senior A scoring title with 142 points, 24 more than runner-up John Davis. He was second in league scoring in 1971 and fifth in 1972. The Warriors won the 1971 Mann Cup, the Canadian Senior A championship, in four straight games over the New Westminster Salmonbellies, but lost the 1972 final to the Salmonbellies, also in four games. 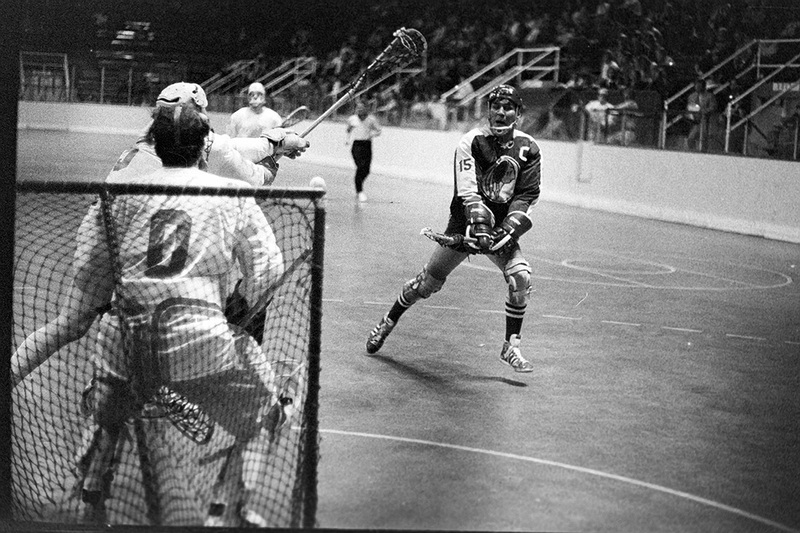 In 1973, Powless moved to the Western Lacrosse Association to play with Coquitlam. A second attempt at a major professional league was made in 1974 and 1975 with the National Lacrosse League (NLL). Powless joined the Syracuse Stingers for the 1974 season, finishing fifth in league scoring and making the first all-star team at centre. In 1975, he played for the Montréal Québécois in the NLL. Powless returned to senior lacrosse and led the Brampton Excelsiors to the 1977 Mann Cup final, where they lost to Vancouver. Plagued by a trick knee and a sore back, he retired in 1978. Powless retired with exactly 1,000 points in combined senior/professional play and had a career success rate of 75 per cent in face-offs. After he retired from lacrosse, Powless stayed active on the Six Nations of the Grand River reserve, where he coached lacrosse, hockey and figure skating, supported activities for Six Nations elders and promoted sports for Indigenous youth. Powless was named to the Canadian Lacrosse Hall of Fame in 1990 and joined his father, Ross (who had been inducted in 1969), as the only father-son tandem in the hall. Both have also been inducted into the Ontario Lacrosse Hall of Fame. The man once called the “Gordie Howe of lacrosse” died on 28 July 2001 from colon cancer. He left behind his wife, Patti, son, Chris, and daughters, Michelle and Gaylene. Just days before he died, the Six Nations Sports and Cultural Memorial Centre was renamed the Gaylord Powless Arena. In April 2017, it was announced that Powless would be inducted into Canada’s Sports Hall of Fame on 9 November 2017. He is one of only eight honoured athletes and builders to be inducted exclusively for his lacrosse career.